Over the last couple of weeks I have been trying to formulate a law based on my experiences over the last 8 or so years writing software for companies. I think I have almost nailed it. The total amount of unnecessary time elapsed between a developer requesting a new keyboard, to the time when it arrives in their hands, is directly proportional to the amount of bureaucracy within the department or organization he/she works for. As a corollary, this time is inversely proportional to the amount of influence software engineering experience has within the upper management of said company. I thought about drawing a linear / exponential function, while lining up for a beer at a club on the weekend. 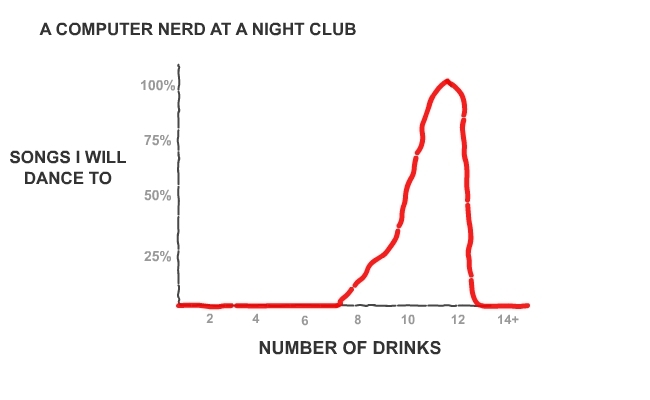 To prevent myself from becoming either an alcoholic or one of those ‘holding a drink dancers’ (see graph x:[7-9]), I will just no longer go to night clubs.